The Department of Physics at Arizona State University offers a STEM program of courses specifically designed to meet professional development needs of high school and post-secondary physics, chemistry, and physical science teachers. Teachers can enroll in these courses to earn credit towards re-certification, become more effective, progress toward becoming qualified faculty by the Higher Learning Commission, pursue an interdisciplinary Master of Natural Science degree (MNS), or as electives in Education degrees. For some courses, prerequisites are two semesters of trigonometry-based college physics and an introductory calculus course (brief calculus is sufficient). Most courses are held during the summer. Depending on teacher interest, they may be offered at other times. A Modeling Instruction course is offered each spring semester (and each fall semester, starting in 2016). Modeling Instruction & MNS programs brochure. Flier of upcoming summer courses. best preparation to become highly qualified and/or certified. View. Download. Physics First professional development in Modeling Instruction. View Download. Want to donate to our ASU Foundation "Improving Physics and Chemistry Teachers" scholarship fund? Click here. Or donate to our scholarship endowment fund, and thus contribute to scholarships in perpetuity, by visiting this URL: asufoundation.edu/endowmodeling. Since November 2016, every donation to our endowment fund is matched, 1-for-1, by Jane Jackson. Double your investment! Modeling Workshops nationwide are listed at the American Modeling Teachers Association website: http://modelinginstruction.org and at http://www.phystec.org/pd/?set=Modeling Each summer, about 50 are held, in typically 20 states. Would you like to host (or attend) a Modeling Workshop? Download this 2-page "how to". Category I. Physics pedagogy. Core courses on physics teaching (PHS 530 & 531) are open to anyone seeking to improve their practice of teaching physics; they are required for those seeking the MNS degree. These courses provide thorough grounding in research-based physics pedagogy integrated with content in full accord with the National Science Education Standards(NSES) and use of computer technology in physics teaching. Although subject to faculty oversight, most courses in Category I and some in Category II are taught by teams of outstanding in-service physics teachers. This conforms to the "peer teaching principle" espoused by the NSES, which holds that professionals are best taught by peers who are exceptionally well-versed in the objectives, methods and problems of the profession. foster collaboration between physics teachers and teachers in other sciences. Consider PHS 542: Integrated Mathematics and Physics. This course takes the position, admittedly atypical, that understanding science requires mathematics and understanding mathematics requires science. The course examines the commonality in conceptual physics models and mathematical models in such a way as to promote an ongoing dialogue between physics and mathematics teachers. An emphasis is placed on the underlying structure of student learning (multiple cycles of data gathering, model building, data interpretation, and model generalization) as a means of guiding modeling instruction. Enrollment of physics/mathematics teacher teams from the same school is encouraged. In summer 2008, the focus was on grades 8 and 9 because of the movement nationwide toward Physics First. Category III. Contemporary physics. These courses are taught by research faculty who work in areas addressed by the courses. The listed courses span the range of major research areas in contemporary physics. They introduce teachers to ideas, methods and results of 20th century physics that are ordinarily taught only to physics majors in advanced undergraduate and graduate programs. The courses bring physics teachers into extended contact with research faculty to share the excitement of scientific research. They provide unprecedented opportunities for researchers to explain their fields to highly-motivated, well-informed teachers and thereby influence their students. Leadership Workshop The one-day-per-week leadership workshop is directed by experienced Teaching Associates. The main purpose is to build a cohesive peer learning community focused on action research. Teachers collectively consider how to expand what they have learned in courses through science interest groups, and how to use it in extra-curricular projects and science clubs. Course design. The ultimate target for the MNS program is not the teachers themselves but their students. Therefore each course addresses the subject at a level which prepares teachers to entice and inform their students. The teachers are engaged in activities and projects that they can set up for their students. As the standard high school curriculum does not include "contemporary physics," teachers need the material developed in a modular form that can be used for extracurricular projects and interest groups or in advanced enrichment courses for seniors. In the long run, this serves to prepare teachers for sorely needed content reform of high school science. Such reform, as advocated by AAAS Project 2061, will never be achieved without preparing the teachers. Teaching Guidelines. Faculty who teach the MNS courses agree to support the objectives of the project and adhere to the following teaching guidelines. Selection of topics is influenced by preferences and needs of the teachers. Assignments adapt course material to instructional modules that teachers can use with their own students. Level-Subjects are addressed at the level of a Scientific American article, although some use of algebra, calculus and vectors may be appropriate. Modeling: Teachers are involved in explicit formulation and analysis of the models inherent in the subject matter. Collaborative learning: Teacher expertise in collaborative learning is exploited in the design and conduct of class activities, experiments, discussions and presentations. Lecturing is limited in favor of discussion and collaborative learning. Laboratory experience acquaints the teachers with operation and use of modern scientific instruments such as the laser and the electron microscope. Doctoral program. ASU offers a doctorate in science education through a Learning, Literacies, and Technologies Program, an interdisciplinary program between the College of Liberal Arts and the College of Education. Thus, talented teachers in the MNS program have an option to continue with doctoral research in science education. Visit this URL: education.asu.edu/programs/graduate . Transfer to other masters degrees. Teachers in the ASU-College of Education M.A. in Curriculum and Instruction: Accomplished Teaching (same URL as above) can take up to five of our courses as science content electives. Teachers in the NAU MAST degree can transfer up to 12 credits of our courses. Teachers in the U of A Teachers in Industry masters degree program are encouraged to take our courses in spring and fall semesters. First-semester courses in Category I (Modeling Workshops) are held each summer, as is the Leadership Workshop. Courses in Categories II and III are rotated; each course is held every two to five years, according to teacher interest and faculty availability. Below is the schedule of upcoming MNS courses in summer 2019. For in-service and preservice high school teachers and post-secondary faculty. You can take up to 6 credits in 5 weeks, per AZ Board of Regents. The course offerings are repeated in subsequent summers. Most teachers who attend both summer sessions complete requirements for an MNS degree in three summers (or 2, if they include 9 transfer credits). Teachers are highly satisfied with each course. For example, in summer 2009, 130 teachers participated in 10 courses. On a 10-point scale, teachers gave every course an average overall rating from 8 to 10. We strongly recommend that teachers take a Modeling Workshop before our other courses, as Modeling Instruction is the foundation of our program. Most teachers find the modeling approach far superior to traditional instruction. It's adaptable to all sciences. Apply for TUITION SCHOLARSHIPS, or reserve a seat for CEUs, &/or get housing help: for summer 2019. 1)ARIZONA high school teachers (in-service and pre-service) can apply for a partial tuition scholarship. Housing opportunities, tips on what to bring to ASU, and how to get around in Tempe: Download or view this info (updated in June 2018). * Dorm on Tempe campus: In summer 2019, a private bedroom and bath shared with 1 other teacher is expected to cost about $750 for 3 weeks, + $25 linens (optional). The dorm is probably Tooker House; it is brand-new and across the street from the physics building; you can cook down the hall. Contact jane.jackson@asu.edu to reserve a room. * Family housing in Scottsdale, or off-campus housing in Tempe. 1) Download a sample grant proposal to help you obtain funding. 3) Ask parents to donate (2018). Download this sample letter. 4) A list of funding sources for teachers, from foundations and community service organizations. 6) MNS DEGREE teachers in 15 western states can apply for in-state tuition. See the ASU Department of Physics MNS financial assistance webpage for the WRGP application form. The deadline is April 1, each year. The URL is physics.asu.edu/graduate/mns/financial . The AZ Board of Regents decides on summer tuition in late February. Summer tuition is much LESS than academic year tuition. ASU tuition in summer 2018 was $609 per semester hour ($1067 out-of-state). Fees were $204 for 12 weeks, but some are prorated, so tuition/fees for a 3-week 3-credit grad course were $1955 (and about $1330 for 2 credits). ASU tuition in summer 2017 was $601 per semester hour ($1052 out-of-state). Fees were $183 for 12 weeks. ASU tuition in summers 2016 & 2015 was $589 per semester hour ($1032 out-of-state). Fees were $202 for 12 weeks; tuition/fees for 3-weeks were $1875. ASU tuition in summer 2014 was $572 per semester hour ($1001 out-of-state). Fees were $139 for 12 weeks. ASU tuition in summer 2013 was $556 per semester hour ($972 out-of-state). Fees were $139 for 12 weeks. ASU tuition in summer 2012 was $539 per semester hour ($944 out-of-state). Fees were $139 for 12 weeks. ASU tuition in summers 2010 & 2011 was $509 per semester hour ($849 out-of-state). ASU tuition in summer 2009 was $485 per semester hour ($806 out-of-state). ASU summer tuition in 2008 was $326 per semester hour ($571 out of state). Fees were $25 per summer session. To find ASU tuition and fees for any year and any category, visit this URL: students.asu.edu/tuitionandfees , and click on "Tuition and fees schedules", etc. The MNS program in physics for teachers started in 2001, and 84 teachers earned this degree from 2002 to 2018. Eligibility. The program is open to inservice high school teachers who have completed two semesters of college physics and an introductory calculus course. Under-prepared teachers can make up deficiencies in regularly scheduled courses. Six credits in "Methods of Teaching Physics," unless courses with an equivalent emphasis on physics pedagogy have been taken as an undergraduate. An Action Research Project for two credits (or three in rare cases, with permission from Director). A minimum of six credits must be taken in the "Contemporary Physics" category. Graduate courses in physics or other natural sciences can apply toward the remaining credits if approved by the student's supervisory committee. As of 2013, the GRE General test is NOT required. Also, up to 12 semester hours can be transferred into the program.The 30 credits must be earned in a 6-year period -- no longer. As of summer 2014, teachers in 15 western states can apply for in-state tuition. See the ASU Department of Physics MNS financial assistance webpage for the WRGP application form. The deadline each year is April 1. The URL is physics.asu.edu/admissions/mns-admissions/financial-support . Transfer courses: Some distance/online graduate courses may qualify, if approved by the student's supervisory committee. The course must be part of a graduate degree program at the respective university and must be approved by the ASU Graduate College. Highly recommended for all teachers are the two courses on Matter and Interactions developed by Drs. 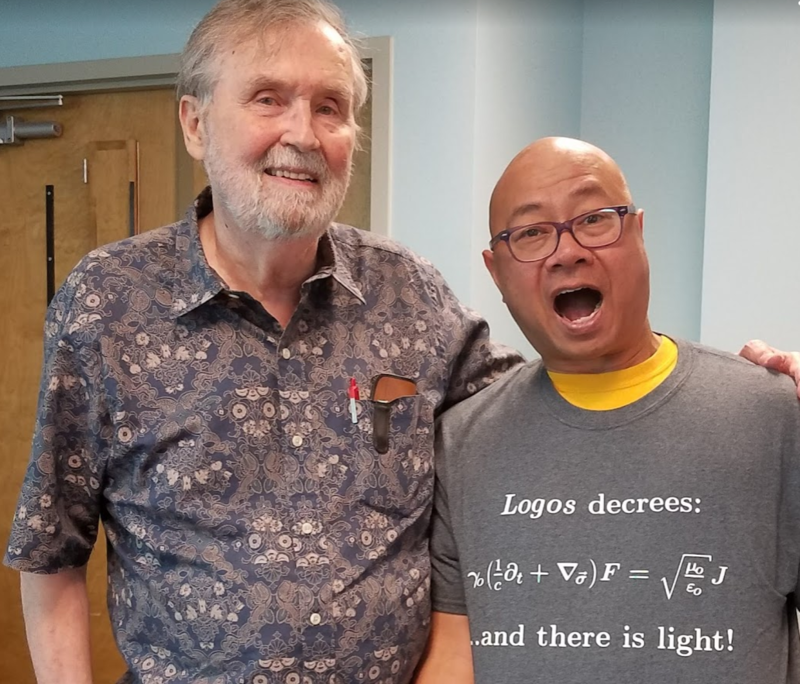 Bruce Sherwood and Ruth Chabay at NCSU (Science House). The URL is: matterandinteractions.org/instructors/distance-course-for-hs-teachers . PHS 505/CHM 594: Energy and the Environment (3). For high school and post-secondary teachers of all sciences and math. Current problems in energy resources, production, consumption, and conservation. Prerequisites; one semester college chemistry and physics. Math teachers need a strong science background. Download a template for a Modeling Instruction lesson plan. PHS 531: Methods of Teaching Physics II. (3 ) This Modeling Workshop expand the modeling techniques learned in PHS 530 to microscopic models of electricity and magnetism. Greatly influenced by the work of Sherwood and Chabay. Prerequisite: PHS 530/PHY 480 or instructor approval. PHS 534/PHY 494: Methods of Physical Science Teaching I. (3) Physical science and mathematics content integrated into coherent instructional units. Design of curriculum and conduct of instruction for physical science courses in high school or middle school. Instruction with collaborative inquiry methods. (Sometimes cross linked with MTE 598.) A sequel to this course was piloted as PHS594 in July 2007, and held every summer thereafter until ESEA funding ended in 2011. ADE letter: PHS534 is content course for general science certification. Download. PHS 540/CHM 540: Integrated Physics and Chemistry (3) Emphasis on coordinating concepts of physics and chemistry with a quantum mechanical description of atomic structure and bonding. Prerequisite: CHM 480 or PHY 480 (PHS 530) or instructor approval; physics or chemistry teacher in high school or community college. PHS 542: Integrated Mathematics and Physics (3) Mathematical models and modeling as an integrating theme for mathematics and physics. Download draft syllabus in .pdf. View. Original syllabus in 2001. PHS 542 theory and homework in 2018. Picture of David Hestenes and Geoff Clarion in PHS542 in 2018. PHS 550: Physics and Astronomy (3) Astronomy curricula and projects for high school and community college, with emphasis on the role of physics in astronomy. Prerequisite: two semesters college physics, knowledge of college algebra. PHS 556: Astrophysics (3) Structure and evolution of stars, galaxies and the universe. For high school and community college teachers. PHS 560/CHM 560: Matter and Light (3) Interactions of light with matter. Lasers and spectroscopy. Prerequisite: two semesters college physics and one semester calculus. Download syllabus. View. Read comments from a physics teacher who took the course in 2001. PHS 564: Light and Electron Optics (3) Principles and practice of optical and electron-optical instruments. Reflection, refraction and diffraction. Microscopy, spectroscopy and holography. Instrument design, operation and applications. Prerequisite: one semester college physics. PHS 570: Spacetime Physics (3) Special and General Theories of Relativity with implications for space and time travel. Prerequisite: two semesters college physics. PHS 581/CHM 581: Structure of Matter and its Properties(3) Models of matter and its properties: mechanical, thermal, optical, electrical, magnetic. Prerequisite: two semesters college physics. PHS 593: Applied Project: Action Research in Physical Science (1-3) A project oriented course for inservice physical science teachers. Action Research Projects (aimed at practical improvements in teaching practice) will be undertaken by teams of two or more teachers. Projects begin with a written proposal subject to approval by the instructor. Classroom implementation and evaluation may be required. A final written report and a public presentation to peers at a meeting or by a published paper is normally required. May be repeated for credit. Download Action research policy document. View. Download AR weekly timesheet-template. View. Download AR evaluation checklist. View. PHS 598: Leadership Workshop (1) Described above, the main purpose is to build a cohesive peer learning community among teachers in the MNS program.focused on action research. Teams of teachers learn to engage in action research. Can be repeated once for credit. Download course description. or View. See also PHS 593. PHS 594: Workshops in Physical Science (1-4) Collaborative workshops on various topics in physical science and its integration with technology for inservice teachers. Workshops that have been held are listed below. PHS 594: Modeling Workshop in Waves (2). PHS 594: Modeling Instruction in Mechanical Waves and Sound (3) Prerequisite: PHS 530/PHY480. Download syllabus. or View. Lab write-ups: format and rubric (by Michael Crofton; 2018). Daily calendar for 2018: Download. or View. PHS 594: Advanced Modeling Workshop (3) Cognition, modeling discourse management, energy thread, assessment, other issues. Prerequisite: two modeling workshops. CHM 594/CHM 480: Modeling Instruction in Chemistry I (3) Key concepts in 1st semester high school and post-secondary general chemistry from a model-centered perspective. Prerequisite: chemistry or physics teacher or instructor approval. CHM 594: Modeling Instruction in Chemistry II (2 or 3) Key concepts in 2nd semester high school and post-secondary general chemistry from a model-centered perspective. Prerequisite: Modeling Instruction in Chemistry I.
CHM 594/PHS 594: Thermodynamics Modeling Workshop (2 cr). Key concepts in thermodynamics in high school and post-secondary general chemistry and general physics, from a model-centered perspective. Prerequisite: Modeling Instruction in Chemistry I, or mechanics Modeling Workshop. advise faculty on course level and pace and on specific course objectives. help with course design and selection of instructional materials. This included a survey (with help from project staff) of suitable instructional resources, including websites. help organize and manage teacher work in collaborative groups. provide faculty with objective feedback on teacher needs. The ASU Department of Physics has a web page (physics.asu.edu/student-life/mns-experience/academic-advising) where MNS degree students can download all the necessary resources & forms, and get academic advisement. Forms include Program of Study (POS), petitions, graduation deadlines and procedures. Each teacher who receives financial support is asked to give the appropriate instrument to at least one class as a baseline post-test and in the following year as both a pre-test and a post-test, to evaluate the effectiveness of your instruction. The instruments below are password-protected. Participants are given the password during their summer coursework at ASU. Should you lose your password, you may get a reminder by contacting Jane Jackson. If you wish, e-mail your summary test results in an Excel spreadsheet to Jane Jackson. Math Concepts Inventory (for 8th and 9th grade students). v7b w/o CTSR questions. Math Concepts Inventory research. Basic Energy Concept Inventory (for 8th, 9th,10th, and 11th grade science students) and answer key. Teachers' appreciation letters to ASU administrators (2005-2007) for Modeling Workshops. How teachers want businesses to give them financial support ,-- written by a dozen Arizona physics and chemistry teachers. A business plan by teachers, to support their professional growth, by Robert (Robin) Blackford, physics teacher-leader in rural AZ. Return to the Modeling Instruction home page. Department of Physics, ASU, P.O. Box 871504, Tempe, AZ 85287-1504.